We don’t usually talk about many tournaments outside of the World Poker Tour, World Series of Poker and EPT but a few events in some of our favorite poker rooms, online and not, are worth mentioning. 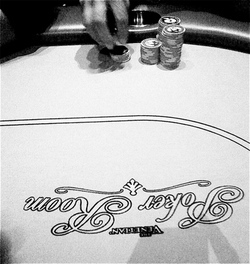 :: Chances are if you’re looking for the entities in a poker room in Las Vegas, we’ll be at the Venetian Poker Room, and our favorite place to toss cards on the strip is hosting its 2008 Deep Stack Extravaganza I right now. The first event kicked off Monday with Phil Gordon and Barbara Enright, a woman, among the 571 registrants competing for a $165,309 prize pool. Events are running daily until Feb. 24, offering a range of buy-ins, from $330 to $2,600. For the complete schedule for the 2008 Deep Stack Extravaganza I, go here. :: Big overlays in Bodog‘s Sunday $100k guaranteed event are the norm, and the same is true for its 2008 WSOP online qualifiers, which fired up this week. At least three WSOP ME seats are guaranteed every week, with more to be added in March. Find out more about playing the WSOP this summer on Team Bodog here. Bodog Girls here. :: With Macs out-numbering PCs at the WCP compound, Full Tilt Poker has long been a go-to site for the entities, and you’ll likely find us playing several events in the Full Tilt Online Poker Series VII, which kicks off today with a $750,000-guaranteed NLHE event. The final event of the series is Feb. 17 and guarantees a $2 million prize pool. For the complete FTOPS VII schedule, go here.